After changing ESCs to new ones with BLHeli, I have a Problem with PosCTL behaviour. Stabilize is currently smooth, but in PosCTL when accelerating it works perfectly but during deceleration I got one very strong oscilation. Can somebody give me a hint as to which Controller may fix this? Take a look at what the multicopter position controller is doing (MPC_* params). Start by comparing velocity and position with vehicle_local_position and vehicle_local_position_setpoint. I don'k know the exact cause but I have a comment. It is strange that the green line 'Pitch Setpoint' in the second plot increases after near the time 6:37.500 although the green line 'X / Pitch' in the first plot almost hold the current value horizontally. What I did is decelerate Pitch, so Pitch was almost at middle at the end. So the Vehicle tried to brake, just the reaction is probably too aggressive, so the Controller tries to compensate which ends up in this Spike. However I ended up having a MC_PITCH_P / MC_ROLL_P of about 3 (default was 6.5, which I reduced to 5 in the above flight). I'll try to perform a test flight with these settings and report here. Also I updated to current master (as of 7.11.17). A quick Testflight showed still a similar behaviour but as the PITCH & ROLL Gains are now way down the Aircraft did not expose the Hickup as drastically as it did before. Still the effect shows in the log. With the lower Values the Aircraft flies like a wet cleaning Mop. @dagar any hint for me? Hi, Andreas. Are you flying well these days? As reviewed your flight log graphs (but it's too late), it seems there's no strange oscillation or special problem in you flight log. 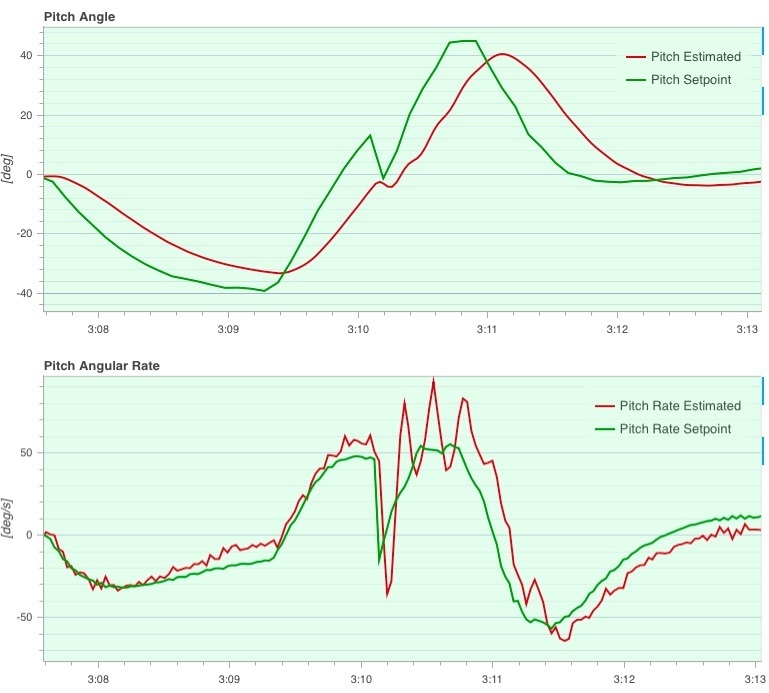 The pitch graph is normal in decelerating. Such amount of overshoot can be possible, if you don't want such +- 40 deg tilt angle reduce the position controller gains or limit the maximum XY velocity or maximum tilt angle. But a little oscillation in pitch rate seems due to the too much P or the ratio between P and D gains of attitude rate controller. So you'd rather change them until it disappears.